As NJEA members look back on a school year of personal and professional successes, it’s important to review what we have been able to accomplish together as a union. 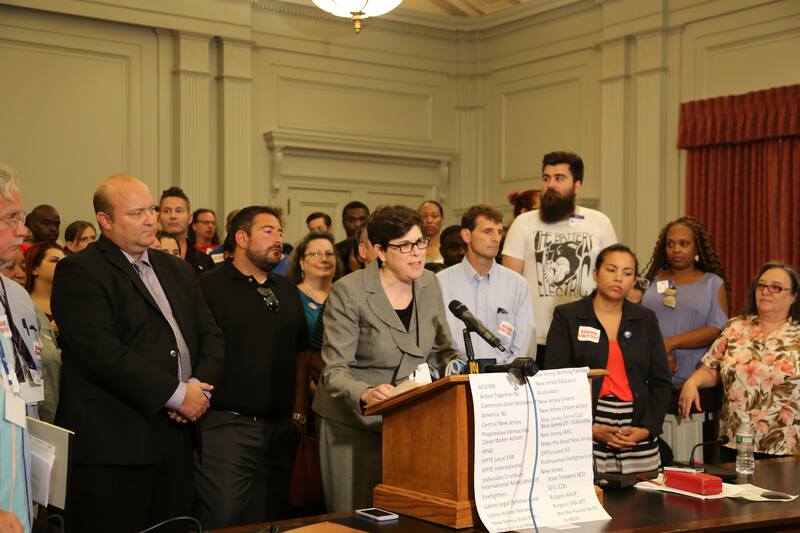 NJEA is arguably the most powerful and effective labor union in New Jersey, and certainly one of the strongest public education labor unions in the nation. That strength and expertise has contributed to a year of progress and success for NJEA members and the students and communities they serve. This past year, NJEA devoted its resources to protecting and expanding the rights of members, ensuring support for public education, and advancing new initiatives that benefit members and New Jersey’s public school students. In particular, NJEA focused on issues related to the economic well-being of NJEA members and their families, including Ch. 78 relief, pension funding, school funding, and preventing harmful legislation. For educational support professionals (ESP), NJEA not only successfully defeated privatization in almost every district that considered it, but also launched a new team-based strategy that brought members of every job description across municipalities to advocate for their ESP colleagues whose jobs were in danger. Working closely with NJEA field representatives and Research Division staff, more than 100 local associations have bargaining language providing Ch. 78 relief for their members. As one of the association’s highest priorities, NJEA is tackling Ch. 78 from every angle. In addition to fighting for relief through contract language, NJEA is educating legislators about the economic devastation inflicted on members as a result of Ch. 78 and sharing their stories with every legislator in the state. Sen. Joseph Cryan has just sponsored S-2606, legislation that would provide relief from exorbitant health benefit premium sharing. NJEA has spoken extensively with Gov. Murphy to ensure that once legislation passes both houses, it will be signed. 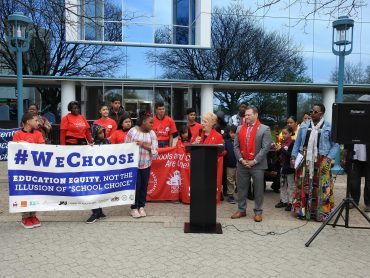 Following a one-day strike in Jersey City, the first in the state since 2004, the Jersey City Education Association (JCEA) settled a contract that not only provided Ch. 78 relief, but also improved salaries, benefits, and working conditions for every member. Read more about the JCEA’s settlement, as well as exceptional agreements in Paterson, Pleasantville and Stafford Township. At the same time, NJEA staff worked closely with local presidents and negotiating teams to ensure that the approximately 300 local associations currently bargaining had the expertise, support, training, and resources they needed to bargain the best deal possible for their members. NJEA provided support to ESP members in local associations facing privatization of their jobs. Fighting against privatization is a top priority for NJEA. In addition to confronting privatization threats at the local level, NJEA has worked to re-introduce legislation that would provide additional protections to ESPs. While NJEA successfully moved the legislation through both houses during the 2012-13 legislative session, Gov. Chris Christie refused to sign the bills. One set of bills, S-296/A-3185/A-3395, would prohibit employers from entering into a subcontracting agreement that affects the employment of those covered by that contract during the term of an existing collective bargaining agreement. Another bill, A-3664, would extend to nonteaching employees of local, county or regional school districts, boards or commissions the right to submit to binding arbitration any dispute regarding whether there is just cause for a disciplinary action. In addition, NJEA continues to fight for the rights of ESP staff at the local level by working to incorporate contract language that protects their rights. And NJEA continues to fight for members when their individual rights are violated. In Pleasantville, NJEA network attorneys won a recent arbitration before the Public Employment Relations Commission (PERC) and saved the jobs of an instructional aide and a security guard. At the local level, NJEA provided support, resources and staff to help save the jobs of custodians in Hopatcong, paraprofessionals in Green Brook and bus drivers in West Milford. NJEA heralded a major victory for members in Paterson when it won a $7 million arbitration on their behalf after the district failed to advance employees on the salary guide. In January, NJEA assisted a member in Mantua Township to win back pay and service credit for her military service. 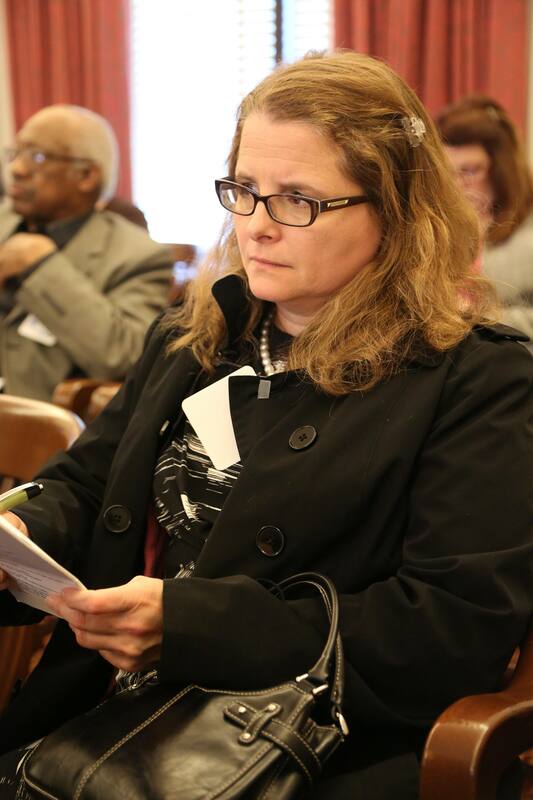 She had been unaware of her rights until she joined the NJEA Patriots Alliance, a community of members within NJEA who have served in the United States armed forces or who are currently serving as JROTC instructors, in the National Guard, and in the reserves. In November, NJEA worked with the Millville Education Association to defeat an anti-union ballot question that targeted ESP by trying to remove them from civil service protections. In court, in the community, and at the ballot box, NJEA members fought to protect their colleagues—and won. Over the school year, NJEA provided more than 2,700 members with a one-on-one pension consultation. More than 500 members attended one of NJEA’s online pension webinars. From providing expert guidance and information to NJREA members about their pensions and updates on the cost-of-living adjustment (COLA) fight, to providing resources and networking opportunities to preservice members eager to obtain their first job in education, to providing the support and professional development members need at every stage of their careers, NJEA is working to meet every member’s needs. Kristina Fallon Tomaino, vice president of South Bound Brook EA, monitors discussion of a higher education health benefits bill in the Statehouse. In addition to advocating at the state level for full funding for schools, expanded access to Pre-K, and increased funding for community colleges, NJEA won a commitment from the Murphy administration to move away from PARCC and lower the weight of student growth percentiles (SGPs) in a teacher’s evaluation. NJEA also funded 46 grants through Sustainable Jersey for Schools that supported projects such as an outdoor classroom, a healthy habits program, an enhanced recycling program and much more. In February, the five schools who won NJEA’s Mighty Fingers art project spent the day with award-winning artist Kelly Sullivan to create their own masterpieces, harness their creativity, and build self-esteem. Over the 2017-18 school year, the NJEA Frederick L. Hipp Foundation for Excellence in Education awarded 17 grants totaling more than $97,000 to NJEA members across the state. 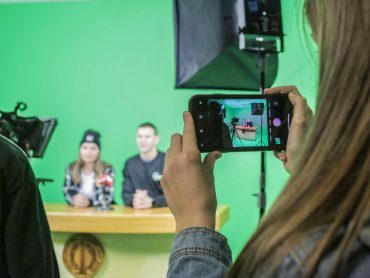 Since its creation, the Foundation has awarded more than $2 million to 378 innovative educational projects initiated by NJEA members. NJEA also provided resources and support to assist the Freehold Borough Education Association (FBEA) fight for fair funding for their schools. For 14 years the district has struggled with over-crowded classrooms and insufficient funding. Thanks in large part to the efforts of the FBEA, new classrooms will be opening and at least 15 new teachers will be hired in September 2018. 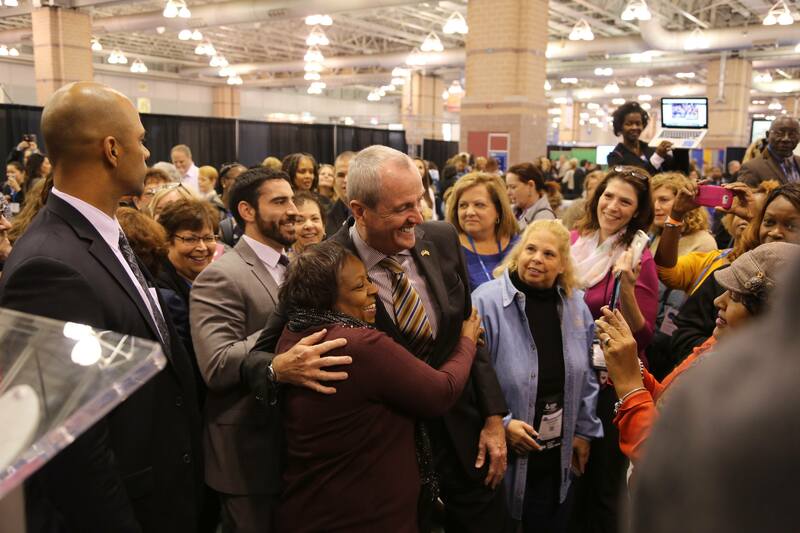 Having endured nearly eight years of combative governance in the Statehouse, NJEA members celebrated the election of Ambassador Phil Murphy as the governor of New Jersey. NJEA contributed to Gov. Murphy’s successful campaign by launching an unprecedented organizing campaign through the primary and general election. Members4Murphy operated 20 phone bank locations across the state, which led to 230,000 phone calls between members urging them to support pro-public education candidates such as Murphy. In addition, door-to-door canvassing, mailings, and outreach at job sites helped encourage greater member participation in the election cycle. At the county and local level, 61 percent of endorsed candidates were successful, including a hard-fought upset victory for NJEA member Balvir Singh and his running mate in Burlington County. Other NJEA members and endorsed candidates were elected in Mullica Township, Franklin Township, Emerson, Park Ridge, and Berkeley Heights. In total, 267 NJEA members ran for offices across the state, from Board of Education to mayor and freeholder. The importance of Gov. Murphy’s election was highlighted in his first state budget address when he called for a four-year phase-in to full funding of the School Funding Reform Act (SFRA) while ensuring that no district will get less this year than last year. In his budget, 94 percent of districts will receive more aid than in the current year’s budget. In addition, Murphy budgeted a $3.2 billion pension payment, a move that will help to restore the state’s credit rating, which has taken a beating over the past eight years. Murphy also budgeted funding to expand Pre-K education, which research shows to be one of the most effective ways to boost student achievement for a lifetime of learning. In keeping with another of his campaign promises, Gov. Murphy’s first budget includes significant increases for higher education, including $50 million for tuition-free community college for families earning less than $45,000 per year. In addition, it increases the Tuition Aid Grant (TAG) by $7.5 million and the Educational Opportunity Fund (EOF) by $1.5 million. Improving access to our excellent community colleges is one of the goals of NJEA’s Higher Education Committee, and our higher education members, in particular, have been strong advocates for Gov. Murphy’s budget. NJEA members have been vocal in the Statehouse, in legislative offices, and on their job sites, educating people about the importance of funding these public education priorities and how they not only benefit the individuals who receive an excellent education in our public schools from pre-K through college, but also economically benefit every person in the state. NJEA promoted the Workplace Democracy Enhancement Act, a bill designed to keep unions strong and effective on behalf of members, by ensuring that employee organizations such as NJEA are able to carry out their statutory duties. It provides the right for unions to have access to and to be able to communicate with the employees they represent. It also protects public employees’ privacy by specifying that personal information, such as home addresses, phone numbers, email addresses and birth dates are not government records and are exempt from disclosure requirements. NJEA Director of Government Relations Ginger Gold Schnitzer speaks in the Statehouse to protect members’ interests during last summer’s government shutdown. NJEA successfully lobbied against school funding proposals put forth by Gov. Christie and Senate President Steve Sweeney that would have shortchanged many districts without addressing the state’s failure to fund the school funding formula. 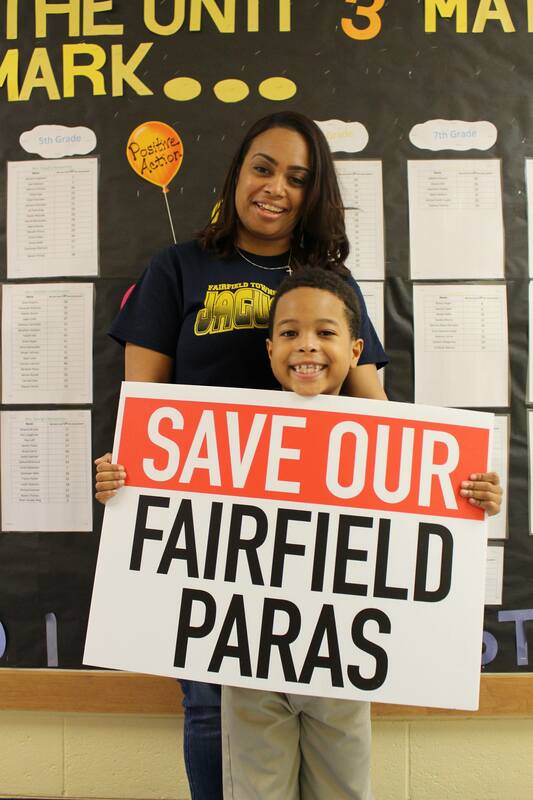 New Jersey’s school funding formula has been held up as a national model for fair and equitable funding. NJEA members’ advocacy on its behalf ensures that school funding is not used as a political slush fund. Last summer, NJEA safeguarded members’ interests during a historic shut-down when the budget bill was not enacted before the June 30 deadline. NJEA protected members from higher health care costs by halting Gov. Christie’s plan to raid $300 million from the reserve trust of Horizon Blue Cross Blue Shield. NJEA successfully prevented a bill from moving in the Legislature that would have eliminated health benefit waivers and coordination of benefits for married couples where both spouses are public employees. NJEA also is actively engaged in fighting an anti-collective bargaining bill that would diminish the benefits of county college employees and retirees by forcing them to switch from the School Employees Health Benefits Plan (SEHBP) to the State Health Benefits Plan (SHBP). As of press time, the bill had passed the Senate, so NJEA members have focused their efforts on the Assembly. NJEA had previously defeated the bill during the 2017 lame duck session. In New Jersey, we are fortunate to be able to build on the successes and strength of those who came before us, and who helped to build NJEA into the powerhouse that it is today. This school year has seen educators across the country stand up, speak up, and walk out of their school buildings and job sites to express their frustration and call attention to the deplorable working conditions, economic packages, and lack of funding for schools that are rampant in many parts of the country. This has happened in North Carolina, Arizona, Oklahoma, Colorado, Kentucky and West Virginia, and many of the issues driving educators to take action have been festering over the past decade or more. 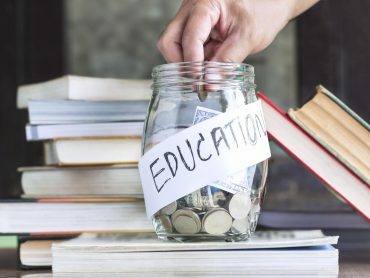 Issues such as inadequate funding for schools, insufficient compensation packages for educators, and shortchanging their pensions drove educators to walk out. Their frustration—and the conditions they have had to endure—underline the critical importance of strong unions and active, engaged members. In New Jersey, we are fortunate to be able to build on the successes and strength of those who came before us, and who helped to build NJEA into the powerhouse that it is today. It is our responsibility to maintain our strong union for the benefit of every member and the students we serve into the future.